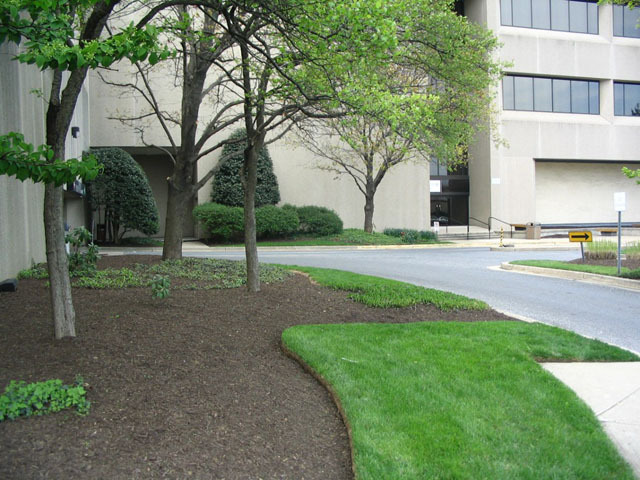 Emerald Landscaping has been maintaining some of the most prestigious commercial properties in Maryland, Washington, DC, and northern Virginia for over 10 years. Our dedicated staff work closely with business owners, property managers, and HOA board members to craft maintenance programs tailored to the specific needs of the commercial site. The upkeep of your commercial property says a lot about who you are as a company or landlord. A well-kept, professionally landscaped facility adds value and trustworthiness to your business. Our commercial maintenance services ensure that your facility remains safe, operational, and aesthetically pleasing all year round. Contact us today to schedule your estimate for commercial grounds maintenance. Emerald Landscaping offers seasonal agreements for turf mowing and the removal of grass clippings. We also take care of fertilization and overseeding, both of which help keep grass green and healthy over the long term. Fertilization adds nitrogen, phosphorus, and potassium to the soil. These elements are essential to healthy grass growth and need to be replenished regularly. Overseeding, also called core aeration or silt seeding, maintains lawn health by providing the grass with new growth for the next season. Emerald also assists commercial customers by dealing with weed and pest issues. Trust us for your commercial lawn care needs. Shrubs generally need to be pruned two to three times per year. To keep shrubs healthy, they also need fertilization and protection from diseases. We will take care of these services for you to ensure that your commercial property always looks beautiful and well maintained. We provide all types of tree service for commercial properties. We remove trees and grind stumps, and we plant trees. We also provide services to maintain tree health, including pruning, fertilization, and disease management. The last thing you want on your commercial property is an infestation of insects. Emerald controls bothersome critters such as ticks, mosquitoes, winter moth caterpillars, and much more, so clients, customers, and residents can enjoy the out-of-doors when they are on your property. We recommend debris cleanup services at the beginning and end of each landscaping season. Our crews remove leaves, other plant debris, and trash from the premises. After a heavy rain or hail storm that knocks branches, limbs, and other tree parts to the ground, Emerald visits properties and performs a thorough cleanup. Customer and company safety is a priority for Emerald Landscaping. Call us if you need immediate cleanup service, and we will assist right away. Once or twice a year, landscapes need mulching. We will remove weeds and debris from the beds and mulched areas, edge all planter beds and tree rings as necessary, and add new mulch. Our seasonal flower rotation program will bring a splash of color to your business. With the help of our creative designers, we work with any business and any budget. The results are always the same: beautifully customized blooms that fit your demands and the appeal of your property. Popular flower options include tulips, daffodils, pansies, petunias, begonias, impatiens, marigolds, and mums. Emerald will keep the flowers fertilized and watered throughout the season.